We decided to not release any records so far couse we totally are in lack of time for our passion. Besides that its great to know that a lot of ears around the globe catched our frequenzies and so many funky moves where swung to our grooves at the most awsomes clubs and unknown basements all over the planet. Digital Prophet releases his first EP on MNTLTRX this year. His Transdimensional Communication Systems EP is a pure techno romance in a future retro apperance. What you hear is what you get. Be prepared! Availible from Decks.de, Clone.nl, Juno.co.uk and Deejay.de soon! We are celebrating 1 year Mental Trax with our next release. Mental Model’s Emotional State EP comes on colored vinyl, limited to 500 hand stamped units with a sticker on top.. So excited!!! We party hard this one for shure! Mental Model’s Bipolar Ep is out now. 340 pieces only with yellow sticker inside each record! We have a lmtd. repress stocked at Decks.de 100 pieces with sticker inside. 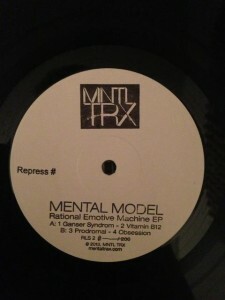 Mental Model’s Rational Emotive Machine Ep is out now. Mental Model EP Clear Vinyl allmost SOLD OUT! We are sold out @ Decks.de and Clone.nl!!! Last instance is Juno.co.uk !!!!!!!!! Mental Model EP Clear Vinyl OUT NOW! Is it acid? Is it techno or even house? No! Its just plain pure pumping groove! MNTL TRX first release by Mental Model comes this winter on strictly limited handstamped vinyl. Listen to the full EP exclusive on Soundcloud.